This article has been written in response to requests on the 12 o’clock high forum. I’ve a habit of quoting from Ultra when posting there and anyone who has looked around this site will see that it makes a lot of use of Ultra material as well. 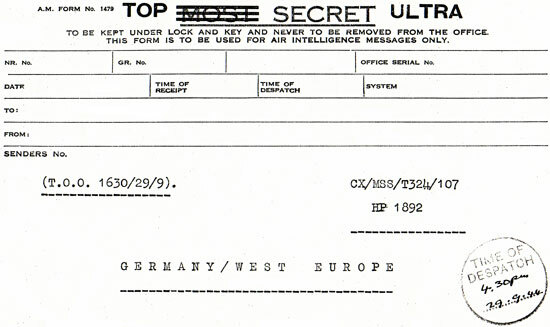 ULTRA or "Top Secret U" was a British (and later Anglo-American) security classification for the intelligence derived from German and Italian “high grade machine ciphers.” The best known of these machines was the Enigma (a brand name), used by the German armed services and other state agencies as well as by the Italian Navy. Enigmas were issued in thousands to tactical units and to individual ships and submarines. At higher command levels and for diplomatic communications, the Germans used machines with a different enciphering system which the Allies also managed to break. All the results seem to have been filed together. The Poles did essential early work on Enigma which they later shared with their British and French allies and, after a hesitant start, the British Government Code & Cipher School at Bletchley Park was able to decipher more and more of these signals and if you want to know how that was achieved or how the cipher machines worked, there’s no shortage of books available. It was in the 1970s that the public first learned that the Allies had been able to read German and Italian ciphers and from what I remember, most of the orignal coverage tended to ask whether the they had warning of this or that enemy plan. Sometimes the revelation of Ultra intelligence helped explain a success (Cape Matapan), elsewhere the question was “why didn’t they see it coming?” (the Ardennes offensive) but at first the intercepts themselves were unavailable for study. As time went on, authors’ interest tended to concentrate on the Battle of the Atlantic and how the ability (or inability) to break ciphers at any given time influenced its progress. This started before the individual reports were declassified and even now you get the impression that when authors say things like “the Allies would have known from Ultra” they may never have read any actual messages. When I first looked at Ultra it was for the same reason the Allies did, to find out what the Luftwaffe was doing. That was in 1987 and it proved an excellent way to compensate for all the documents that didn’t survive the war, as well as complementing the things that did. I think I was the first person to publish anything on Luftwaffe history that used Ultra reports as a source. (However, in 2013 I had sight of an unpublished University of Calgary MA thesis submitted in 1984: Paul Milevič's "Ultra and the Air War in Europe, 1943–45: the RAF and the Luftwaffe" could well have been the earliest exploration of this field). If you’ve looked at other parts of this site, you’ll see that deciphered material makes a substantial contribution to the various articles here. A word of warning: I’ve hardly looked at anything before mid-January 1944 yet so what follows may be of no help for any earlier period. My first impressions of the traffic for 1940 can be found in another article on this site. You cannot depend on finding anything from the units you want at the times you want and promising threads are suddenly cut off when no more messages appear. The messages themselves are often fragmentary and if you’re expecting to be handed the whole story on a plate, you’re out of luck. If you enjoy piecing something together from scattered fragments, then Ultra is for you. You will have an advantage the original analysts lacked, hindsight — with background knowledge of the Luftwaffe and the war in general, you can make sense of things that they could not. 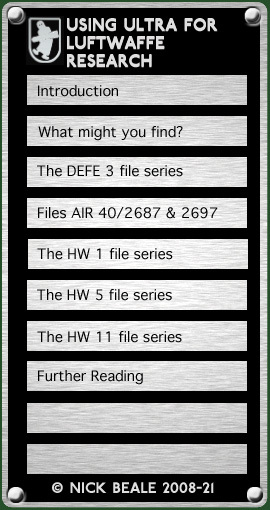 What you won’t have is Bletchley’s card index, thought to have been destroyed after the war, in which occurrences of names, places units and so on were logged and correlated. The style and content of the reports take some getting used to. You can work most of it out eventually and the more you read, the better you get. This brief guide may help you acclimatise but I haven’t a hope of explaining everything, even if I knew it (which I obviously don’t).